Ecova and Aclara promise technology that connects home energy auditors to the smart grid while they’re at your house—and afterwards. North American utilities are spending about $6 billion per year to try to get their customers to stop wasting energy, a tab that includes everything from fluorescent light bulb giveaways to whole-home retrofit rebates. 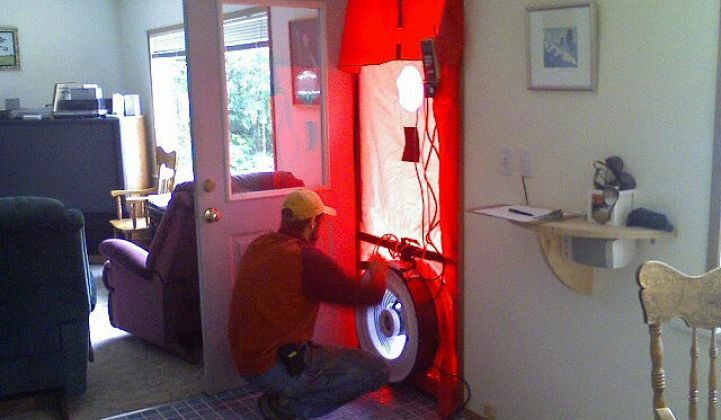 But the biggest energy saving projects also tend to be the most expensive -- and require the most hands-on work. We’re talking about “building shell” improvements like insulation and windows, as well as the systems that heat and cool the building. Before that happens, somebody -- a utility worker, an energy auditor, a contractor, or the like -- will have to spend a significant amount of time talking the homeowners through the process. It would be nice if those door-to-door work crews could have access to real-time data from home smart meters, utility back-office systems and other sources to help make the most of those visits. It would be even better if those one-time retrofit projects could open the door to an ongoing relationship between utilities and their customers. That’s the gist of the “Home Energy Plan” partnership announced Tuesday between energy and sustainability management company Ecova and smart meter and consumer engagement vendor Aclara. In essence, the two are promising to combine mobile workforce technology with smart grid consumer engagement to make each home efficiency retrofit project faster, smarter and longer-lasting. It’s an interesting idea, and it already has a showcase project in Detroit, where Ecova set up a joint venture that worked with utility DTE Energy to improve home efficiency projects. That JV is now seeking to expand the program to include about 30,000 utility customers per year. Beyond that, Ecova and Aclara are “working together to see where the next place is to joint-market the programs together,” Ted Schultz, Ecova’s senior vice president of strategy and innovation, told me in a Monday interview. “We took this concept of, how do you reduce the cost of the audit, and increase the action,” is how Schultz described the Home Energy Plan process. It starts before the first home visit, with software that creates a home energy report based on utility data and “proprietary algorithms” the two companies have put together. That’s a useful concept for how to turn customer energy data into projected efficiency project lists and homeowner behavior tips -- but it’s hardly unique to Ecova and Aclara. Analyzing data for efficiency insights is part of the claims of companies like Opower, Tendril, EnergyHub, EcoFactor and many others in the home energy management space. But Ecova has something those companies don’t: employees who head out into neighborhoods armed with mobile devices that can put home energy data and comparative information at their fingertips. Representatives can show homeowners their home energy profile, pull up the list of efficiency projects at their disposal, and then display real utility price and rebate program data to show customers just how much specific efficiency projects can save them, all in the first visit, Schultz said. Crews carry efficient light bulbs and other housewares in their trucks for same-day installation, Schultz said. If a deeper retrofit project like a shell improvement is called for, the work crews can use their mobile devices to connect to local home improvement retailers and contractors and order up projects in real time, he added -- an important benefit for utilities that sometimes struggle to close the deal with customers. Mobile workforce management is a growing field for utilities, with industry specialist providers like Powel being joined by big IT newcomers like Cisco and IBM. Most of that effort has been focused on utility operations like outage repair crews crews, field maintenance workers and the like, however. Likewise, big commercial and industrial buildings require on-the-ground efficiency experts to come in and properly analyze the building, as well as workers to actually install efficiency projects. New software and sensors can automate much of the analysis side of those projects. Giving on-the-ground workers the mobile connectivity to access those software platforms while they’re in buildings doing retrofits could help them do their jobs. It’s harder to justify sending lots of workers out to visit individual homes, since the potential energy savings per “house call” are much smaller. But meeting customers face-to-face also allows representatives to gather email addresses, phone numbers and other contact information, Schultz noted. Ecova can also feed that customer data back to the utility’s customer engagement platforms, which can range from old-fashioned mailers to home energy web portals. In the case of the Home Energy Plan partnership, that platform is Aclara’s. The subsidiary of Esco Technologies has about 500 utility customers for its smart meter technology, most of them smaller municipal or cooperative utilities. But it also runs customer websites for about 20 utilities that include some of the largest in the country, such as Duke Energy, Pacific Gas & Electric, San Diego Gas & Electric, Pepco, and, notably, Eastern Washington state utility Avista, which owns Ecova. Aclara has about 8 million utility customers receiving its online energy reports today, but only about 1 million of them actively engage with their web portals right now. Getting more customers to log in and learn about their energy usage patterns and costs is the first step to getting them to commit to behavior changes or efficiency investments. Whether or not Ecova’s house-call approach significantly increases customer participation as compared to the cheaper, lighter-touch methods of startups like Opower, Efficiency 2.0, Simple Energy and others remains an open question. There are other ways to ease the financial pain of signing up for efficiency retrofits, Schultz noted. In South Carolina, Ecova has launched on-bill financing programs with several electric cooperatives to fold the retrofit costs into monthly utility bills. States including California are working on on-bill financing schemes that allow customers to measure their costs against the bill reductions that come from a more power-efficient home, while giving the utility a more steady payment stream for their share of the costs. Ecova has also been building up its commercial and industrial utility customer lines of business, which include energy procurement and utility expense management, Schultz said. The company processes about $20 billion in utility bills for customers each year, and wants to expand those relationships to broader energy management, he said. To add to its portfolio of C&I services, Ecova bought Atlanta-based energy management company Prenova in November and Dallas-based LPB Energy Management in January. As for competition in utility energy auditing, companies like Honeywell, Ameresco, Eaton and many others are in the business, as are energy services branches of utilities including ConEdison and Florida Power & Light. Presumably, they may be working on smart grid-utility technology partnerships of their own to tackle the big but hard-to-reach residential market.